It’s the winter season in Hueco Tanks, TX and with strong youngsters all across the fruited plains lacking anything else to do, the sends are starting to roll in. A couple of years back, the V13 du jour seemed to be El Techo De Los Tres Bs with many climbers sending this onetime V14. This year the V13 getting the most action right now seems to be the very classic looking Crown Of Aragorn. Crown has seen recent repeats from Jimmy Webb, Brian Antheunisse, Brion Voges and Phil Schaal. It should be interesting to see how the rest of the season develops. Daniel Woods has vowed to return to complete the 3rd ascent of Fred Nicole’s Terremer (V15). Other than that possibility, it remains to be seen how much of what takes place this winter in Hueco will be newsworthy. How long can one be impressed with the umpteenth repeat of 10 year old V13s? Will any new proud and difficult lines be put up? I’m not trying to be a downer, as any ascent of double digit problems is impressive to me, but this is a topic that has been receiving a fair amount of attention lately. Namely, how much value does one put in repeating problems vs. the establishment of new problems. Some people are saying that the younger “8a.nu generation” of climbers coming of age right now are more concerned with repeating problems for vanity purposes than putting in the work needed for new problems. I’m not sure I agree 100%, but it is certainly something to think about. 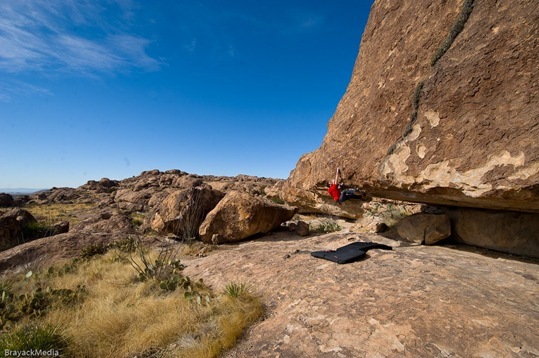 Dan Brayack – Dan is on an extended roadtrip which currently finds him in Hueco. He is a great photographer who happens to be friends with strong climbers like the low key (non 8a.nu user) Matt Bosley, so his updates are usually quite visually appealing. Also be sure to check out his main website for further visual stimulation. Phil Schaal – The low key (non 8a.nu user) Phil Schaal has had a very good year of bouldering Colorado. Among other notable ascents were his repeats of Freaks Of The Industry (V13) and The Automator (V13). Thanks to Sockhands I came across Schaal’s blog the other day which yields further news about his exploits up to and including his current stint in Hueco. B3Bouldering – This goes without saying as I think 99% of my readers also read Jamie’s blog. I would suspect he will have updates from Hueco not only for his blog, but for the Momentum Video Magazine as well. If you are seeing news from Hueco anyhere else, feel free to share them in the comments. Good points Narc. The Hueco scene seems to me to be like popular surf breaks in California and Hawaii have become; they are a place for media and “professional” athletes to congregate to feed off each other. Very little that is original or really interesting is happening and making the image is everything. What the economy is going to do to this artificial ecosystem is an open question. while this may be so, the idea of testpiece problems getting dispatched all over hueco mountain all of the days by tons of folks is mind blowing for me. gone are the days of climbing a v10 as being impressive. how many today? how many tomorrow? but in some senses, this kind of intense playground scene *is* something new… skill exhibited on such a grand scale… almost uniform… it’s not the feat of any individual that is particularly impressive, it is the gross size of this hyperactive school of fish. the energy in a shoal of sardines fuels the entire ecosystem. the thoughts and actions of most individuals in history are far outshined by that individual’s INFLUENCE on others…. it is people coming together in mass that actually implements the change and progression. the individual just plants a seed. point? from a dynamic scene such as this, there are bound to be climbers who emerge who take the concept of difficulty in our sport to new heights, but it will be the psych and environment that will allow one of these little prodigy’s to grow and each joe-average v12 sender will have had something to do with it. more of the same: i’d actually argue that the sending dynamo phenomenon is actually much more important to rock climbing than, say, a lone climber projecting the hell out of a futuristic route hidden away in some obscrue corner of the world. adam ondra’s rampage of established route seems to be doing more to motivate climbers than the establishment of rouhling’s ‘akira’, for instance. also, while sending FAs is always important to the community, i’d argue that sending some sikk hard FA that is remote from much other climbing is substantially less important than the establishment of entire new sectors of climbing. the locust mentality of the current bouldering scene favors the latter. even though it is frustrating for a developer to have the secret spot blow up, as long as access issues are properly managed by the locals AND non locals, it seems that the publicity does much more for the community and progression of the sport. if under the radar strongmos like this gaskins dood are indeed establishing insanely difficult boulder problems, well, great. so far, however, his lines have seemed very unimpressive in photos and any repeats would be merely to confirm or reject his grades… not because they are particularly worthy enough to travel across the globe for. now, if they were smack dab in the middle of a new sector of rock with climbs of more impressive stature for all levels… THAT would have much greater worth. I agree with most of your points sock hands but I’d like to add that one particular strong-mo had quite a lot of influence doing obscure hard stuff in the woods on less than five star lines. His name was John Gill. I’d argue that the greatest progressions come from strong communities such as those seen in Hueco or Spain that foster mutant strong individuals who are, in turn, inspired but tales of crushing but the lone wolves in the woods. These guys, the youngsters, then head out to do some crushing of their own. Gaskins, for example has served as a sort of icon to a large number of strong British climbers. While they might not go on to repeat his problems, they are certainly motivated by his ascents and the lore born out of his incredible finger strength. Also, I’d like to add that advocating for people to stop feeding their egos by repeating hard problems and encouraging them to do FAs is kind of counter productive. If their only reason for doing FAs is because it is no longer cool to repeat established problems then the motivation remains “vanity”. I personally enjoy doing both and I don’t have a problem with people doing only one or the other as long as their motivation is pure. Your blog better be ripe with non-vain updates of your upcoming trip to Hueco. Don’t sell out. this weekend i was planning on climbing. i still am. it figures, however, that the forecast is going from sunny and 48ish to precip just in time for my session. rage! will this prevent me from climbing? hells no. will it prevent any friends from showing up to hang out and climb with me? yes. thus, any sending that takes place will go from of ultimate importance to everyone to mere masterbatory floundering. so, is it not worth doing if there’s no one to do it with, like the song tells us? maybe. or, maybe that’s what blogs are for? bringing friends in on the session after the fact? Interesting stuff. I read the post, read the comments, started to write a response, and ended up with more than 500 words. Oi. What does progress mean in climbing? Hard repeats are cool to hear about/watch. I think they can help create energy like Socky says. I hope that it leads to more opportunities for others to climb (and not more access problems). I’m conflicted about exactly how important that is. If you want more (don’t know why you would), you’re welcome to become the third visitor to my blog ever. A big thanks to everyone for their thoughts! I would like to say that “vanity” probably was not the correct word to use. Maybe notoriety, attention getting or something along those lines would have been a better word. I saw some of this repeat and spray mentality on my last trip to Hueco. It was my first time visiting the feather, and I was pretty psyched to see it. I had no chance of climbing it, but I wanted to at least see it. While there, a climber who will remain nameless, pulled out his ipod touch before looking at the climb, watched the beta from Best of the West four or five times. Got up almost flashed it, then sent after a couple more tries. I was impressed, but at the same time I was dismayed. I have been climbing at Hueco for twenty years, and I have always loved the scene there. Unfortunately this was a huge downer for me. I wonder is this person a good climber? or are they merely strong with a good memory? I personally do not see many new problems coming from this generation. A few of them will break out of the look at me mentality, but not many. Hueco may be better for it though, as it will leave projects for the people who really care about climbing. Craig . . . you seem to be making a ridiculous amount of assumptions about the motivations and intentions of this climber. Why would this bother you? He wanted to climb The Feather, he got some beta for his flash attempt (does the beta source really matter? ), and then sent after a few tries. Why the hell would that be a “huge downer” for you? What makes you so sure that he doesn’t “really care about climbing?” Just trying to understand your viewpoint. All of us chase grades to some extent or another. Climbing is a strange sport. In running, if you run the same circuit every day, you know how fast you can do it and you know when you improve. In a road race, there is a clear winner. Same for soccer or whatever ball-sport. Not so in climbing. So folks look to the numbers to see if they are improving. Big deal. Young pups who are trying to be sponsored and make a living resort to self-promotion. Not so different from many other pursuits. But seeing someone send something hard after watching it on an iPod should be inspiring, not a bummer. Anyway, $0.02. I agree with Craig to some degree. I think the negative feelings brought about by situations like the one Craig experienced goes to the simple source: The deterioration of style and ethics in modern climbing. It seems more and more commonplace everyday for climbers to care more about getting to the top of the hardest route/problem possible as fast as they possibly can. The methods used to get there “style” (even things like the surroundings, aestetics, etc) seem to be of diminishing importance. Sites like 8a make this obvious. If you look at top climbers score cards and comments you often see things like “first try from the start”. It doesn’t matter that they tried the crux 400 times before going to the beginning of the problem for their “psuedo flash”. They obviously feel the need to make their already impressive V13 send even more impressive through the terminology they choose to use. That is just a single example of a mindset that is very prominent in “modern climbing”. Is that what you were getting at Craig? This phenomena is hardly limited to the strongmos out there as I am guilty of doing this myself. I think I’ve done a good job of fighting off the mentality of just trying to do problems by any means necessary because they are given a hard (for me) number, but there is always room for improvement. My penchant for leeching beta to attain a quick send is fairly well known. I am not proud of this, but I am improving. I go back and forth in my head about the benefits of keeping a scorecard on 8a. It provides a good tool for inciting competitive banter amongst friends and I like visualizing what I’ve done over the years. However, the visualization aspect almost becomes addicting in that I feel the need to always do something new when I’m out climbing to have something new for the scorecard even if it means climbing less fun problems. My question is, what is more impressive: Slopping your way through V13, or climbing V10 in such a way that you make it look like it could be V1? I think that most people will go with the 8B send, and it is my personal opinion that that is wrong. Has anyone seen the end of the climbing film “Fuse”, where Fred Nicole is climbing and unnamed problem while he narrates about the importance of Hueco in the background, and it looks like he is warming up?…..that’s the FA of Terre De Sienne. Hmm, I had never heard of this movie before. Is it worth getting? ?